The most significant change to legal immigration in decades could affect millions of would-be citizens, say lawyers and advocates. WASHINGTON — The Trump administration is expected to issue a proposal in coming weeks that would make it harder for legal immigrants to become citizens or get green cards if they have ever used a range of popular public welfare programs, including Obamacare, four sources with knowledge of the plan told NBC News. Details of the rulemaking proposal are still being finalized, but based on a recent draft seen last week and described to NBC News, immigrants living legally in the U.S. who have ever used or whose household members have ever used Obamacare, children's health insurance, food stamps and other benefits could be hindered from obtaining legal status in the U.S.
Immigration lawyers and advocates and public health researchers say it would be the biggest change to the legal immigration system in decades and estimate that more than 20 million immigrants could be affected. They say it would fall particularly hard on immigrants working jobs that don't pay enough to support their families. Many are like Louis Charles, a Haitian green-card holder seeking citizenship who, despite working up to 80 hours a week as a nursing assistant, has had to use public programs to support his disabled adult daughter. Using some public benefits like Social Security Insurance has already hindered immigrants from obtaining legal status in the past, but the programs included in the recent draft plan could mean that immigrant households earning as much as 250 percent of the poverty level could be rejected. A version of the plan has been sent to the White House Office of Management and Budget, the sources said, the final step before publishing a rule in the federal register. Reuters first reported that the White House was considering such a plan in February. A spokeswoman for the Department of Homeland Security said: "The administration is committed to enforcing existing immigration law, which is clearly intended to protect the American taxpayer by ensuring that foreign nationals seeking to enter or remain in the U.S are self-sufficient. Any proposed changes would ensure that the government takes the responsibility of being good stewards of taxpayer funds seriously and adjudicates immigration benefit requests in accordance with the law." Miller, along with several of his former congressional colleagues who now hold prominent positions in the Trump administration, have long sought to decrease the number of immigrants who obtain legal status in the U.S. each year. And even before the rule is in place, the administration has made it more difficult for immigrants to gain green cards and for green-card holders to gain citizenship. 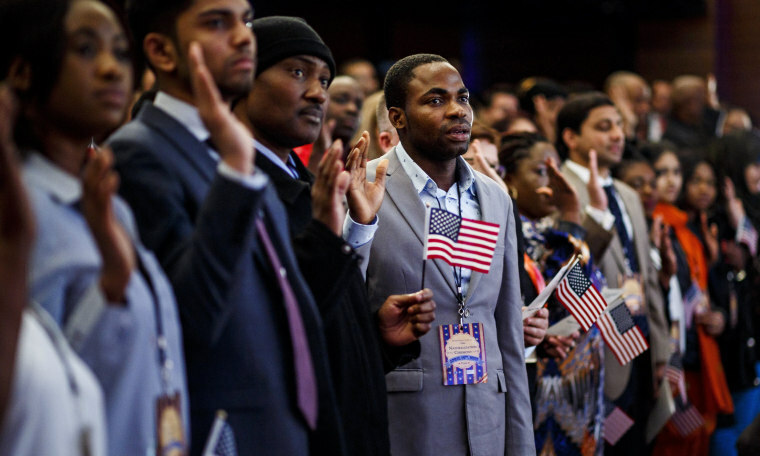 In fiscal year 2016, the last full fiscal year under the Obama administration, 1.2 million immigrants became lawful permanent residents, or green-card holders, and 753,060 became naturalized U.S. citizens, according to data from U.S. Citizenship and Immigration Services. Data from the first quarter of fiscal year 2018 indicates that the administration is on track for a decline in immigrants granted green cards by 20 percent. Data for the first two quarters of fiscal year 2018 for immigrants obtaining naturalized citizenship shows little change compared to the same period of 2016. U.S. Citizenship and Immigration Services says they expect naturalization numbers to rise in the latter half of the year based on previous trends. Four immigration lawyers practicing in Massachusetts, Virginia, Tennessee and California told NBC News they have noticed a spike in the number of their clients being rejected when seeking green cards and naturalized citizenship. In a statement, agency spokesperson Michael Bars said, "USCIS evaluates all applications fairly, efficiently and effectively on a case-by-case basis." “Contrary to open borders advocates, immigration attorneys and activists," said Bars, "USCIS has not changed the manner in which applications for naturalization have been adjudicated, as the law generally requires that an eligible applicant must have been properly admitted for permanent residence in order to become a U.S. citizen. ... We reject the false and inaccurate claims of those who would rather the U.S. turn a blind eye to cases of illegal immigration, fraud, human trafficking, gang activity and drug proliferation at the expense of public safety, the integrity of our laws and their faithful execution." "I did everything they asked me"
Charles, the Haitian green-card holder who works as a nursing assistant in a psychiatric hospital near Boston, said he was stunned to learn his application for citizenship had been denied. He had used a fake passport given to him by smugglers when he entered the U.S. from Haiti in 1989, but confessed to border officers and received a waiver from USCIS absolving him of his wrongdoing and allowing him to obtain a green card in 2011. Now 55, Charles is a homeowner and a taxpayer and thought obtaining citizenship would be a smooth process. "I thought in this country everything was square and fair," Charles said. But when he went for his citizenship interview in August 2017, the USCIS officers told him they were going to revisit the decision to waive the fake passport incident, meaning he could potentially lose his green card as well. Then he received a letter in September telling him his request for citizenship had been denied. "I was devastated. And I'm not sure exactly why they did it. I did everything they asked me to." He appealed the decision, but as he waits for a final verdict, his lawyer says his green-card status may also now be in question. In late November, the Trump administration announced they would end temporary protected status for Haitians who came to the U.S. after the deadly 2010 earthquake. Charles's wife was a recipient of that protection and without him becoming a citizen, he would be unable to vouch for her. But Charles's biggest concern is his daughter. Although she is in her 20s and a U.S. citizen, she has severe disabilities that make it impossible for her to live by herself. Charles is unaware of Miller's new plan to limit citizenship for immigrants who have used public assistance. But it is likely to affect him because he has used public assistance to help care for his daughter, so she could end up further hurting his chances for citizenship. Though its effects could be far-reaching, the proposal to limit citizenship to immigrants who have not used public assistance does not appear to need congressional approval. As the Clinton administration did in 1999, the Trump administration would be redefining the term "public charge," which first emerged in immigration law in the 1800s in order to shield the U.S. from burdening too many immigrants who could not contribute to society. Rosemary Jenks, executive vice president of NumbersUSA, which promotes limited immigration, said the new rule and the increased scrutiny around green card and citizenship applications are all part of a new focus at DHS on enforcing the law and preventing fraud. "Applications for renewal or adjustment of status that have been filed with the government before are being re-examined to look for fraud," Jenks said. In light of this, immigration attorneys are cautioning their clients before moving from green-card status to citizenship. Rose Hernandez is the supervising attorney at the Tennessee Immigrant and Refugee Rights Coalition's naturalization clinic. She said the clinic's model has completely changed in light of the crackdown. She now sends six information requests to government agencies to check on green-card holders' backgrounds before she advises them to file for citizenship. If the government finds something she doesn't, the fear is the applicants could lose their green cards and be sent home. And other immigration attorneys are preparing to push back fiercely against the public charge rule. "Any policy forcing millions of families to choose between the denial of status and food or health care would exacerbate serious problems such as hunger, unmet health needs, child poverty and homelessness, with lasting consequences for families' wellbeing and long-term success and community prosperity," said the National Immigration Law Center in a statement.